Ampio 3 camere, 2 bagni su 4 acri di terra bella. Soffitto a volta in soggiorno con vista sulle montagne. Portico; Grande ponte posteriore w griglia. Una breve passeggiata al fresco, ruscello che scorre (che si trova a fianco della casa); 3 miglia dalla città della Fenicia; 30 minuti dalla città di Woodstock; 20 minuti per Hunter Mountain (per lo sci) / Tannersville. Time Warner Cable TV / WiFi / telefono. Lavatrice / asciugatrice a disposizione nel seminterrato. We loved the house - very warm and charming and a beautiful location! The house was perfect for our family and our puppy!! This is a great location and easy to drive to multiple mountains in the area. Very close to some great food options as well! The house was great for our small group. One thing to note is the driveway is a bit steep, and in the winter is a bit icy. Damian was incredibly responsive and helpful during our stay when we reached out. Can't say enough good things! We stayed here with our dog for New Year’s Eve as a way to get away from the craziness of the city and to enjoy some hiking around the Catskills. The house is perfectly set in the middle of the mountains on a very private road with, as others have said, a creek running through the backyard. We had everything we needed to cook our meals- pots, pans, silverware, measuring cups, etc. The master bed on the first floor is very comfortable. As others have said, there’s lots of kids toys if you bring children along. Overall an excellent stay and we can’t wait to come back! I thoroughly enjoyed my 3-day/2-night stay with my wife and 3 kids (10, 7 and 3). It was raining when we arrived, but there were plenty of board games and toys to keep the kids occupied. My 3-year old slept in the bedroom with the double bed upstairs, and my two older kids slept in the bedroom with the two twins. My wife and I slept in the master downstairs. We felt we had plenty of room. The next day we hiked to Kaaterskill Falls, which were beautiful after the rain the previous day. The hike was kid-friendly, except I did end up carrying my 3-year old on my shoulders most of the way back. The shops and restaurants in Phoenicia are only a short drive away. The pizza at Brio's is surprisingly good. There's a small grocery store there, but we brought most of our own food with us. The kitchen at the house was well equipped. and the gas grill was convenient too. I do caution that if you're interested in more than the beers that are typically available at a gas station you should consider a stop at Beer World in Kingston on your way to the house. The creek is a short walk down the hill from the house, but you can hear it rushing from the deck. If we had visited in November I'm sure we would have spent most of our time playing in the water. Overall the house was all we could have asked for and I certainly would recommend it for a family or small group. Great quiet place in the mountains! 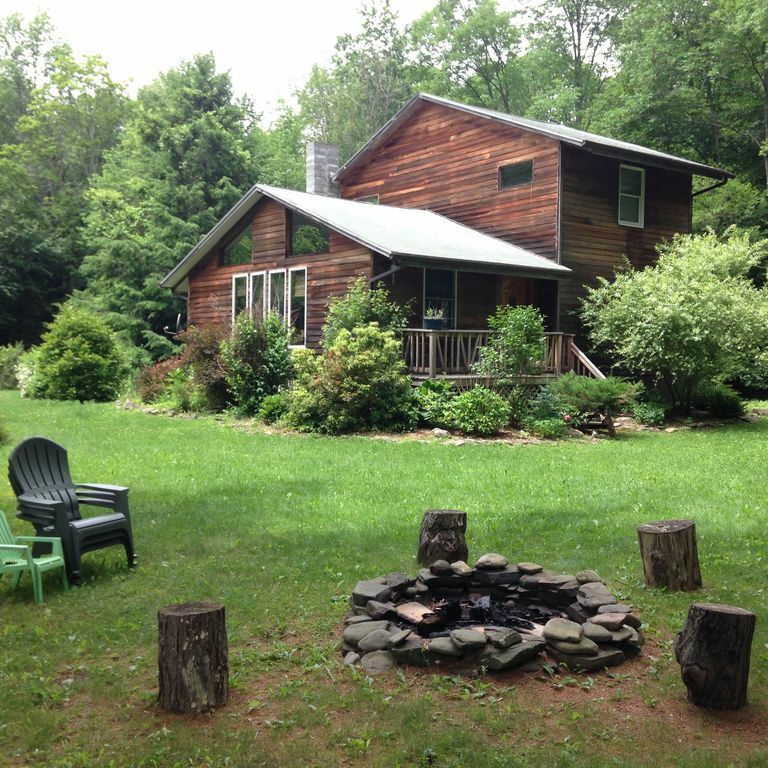 Very comfortable house with well outfitted kitchen - in a beautiful secluded setting. Perfect for a family with children - all set up! we had a very pleasant stay (even though our children are grown(!) Very peaceful!